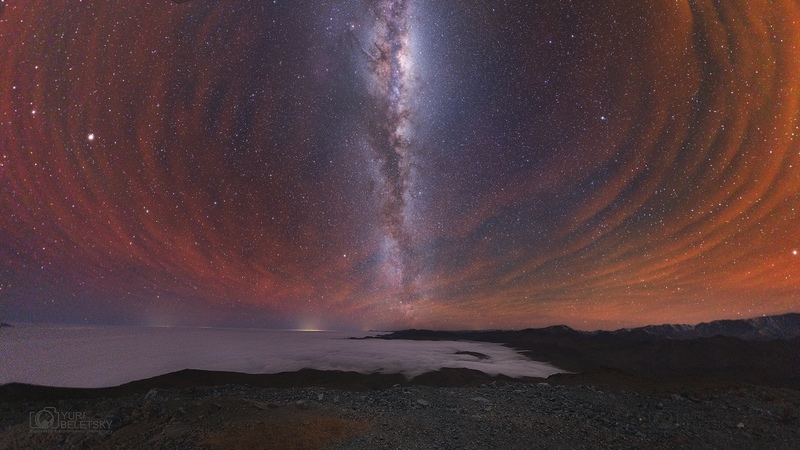 Explanation: After sunset on September 1, an exceptionally intense, reddish airglow flooded this Chilean winter night skyscape. Above a sea of clouds and flanking the celestial Milky Way, the airglow seems to ripple and flow across the northern horizon in atmospheric waves. Originating at an altitude similar to aurorae, the luminous airglow is instead due to chemiluminescence, the production of light through chemical excitation. Commonly captured with a greenish tinge by sensitive digital cameras, this reddish airglow emission is from OH molecules and oxygen atoms at extremely low densities and has often been present in southern hemisphere nights during the last few years. On this night it was visible to the eye, but seen without color. Antares and the central Milky Way lie near the top, with bright star Arcturus at left. Straddling the Milky Way close to the horizon are Vega, Deneb, and Altair, known in northern nights as the stars of the Summer Triangle. Posted on September 4, 2015 by ladyoftheabyssPosted in Articles, Daily PostsTagged Airglow Australis Image, Astronomy Picture of the Day, Carnegie Las Campanas Observatory, Milky Way, professional astronomer, Yuri Beletsky. It was on this date in 1930 that ex-planet Pluto was discovered. On this ‘Pluto Day,’ download an image of Pluto’s glyph and reproduce it in cornmeal on the threshold of your entryway door. It is said that doing so will attract the formidable attributes that Pluto is famous for. Considering that Pluto wields considerable power, you can expect to feel pretty potent after enacting this exercise. Let the cornmeal blow away or sweep it away after leaving it in place for twenty-four hours. Posted on February 18, 2014 by ladyoftheabyssPosted in Articles, Daily Posts, Feng Shui TipTagged Astronomy, Dwarf planet, Ellen Whitehurst, Milky Way, New Horizons, Planet, Pluto, Pluto and Charon, Solar System. Posted on January 22, 2014 by ladyoftheabyssPosted in Articles, Book of Spells, Daily PostsTagged Apsu, Astrological sign, Carbonated water, Circle dance, Dance, Earth, electric blue, Milky Way, Sun, Uranus. Tonight you will be dreaming with the Swan Maidens. Said to have created the Milky Way they dress in feathers and wear silver or gold necklaces and crowns. They are partial to moonstones, skylarks, butterflies, and flowers. Swan Maidens appear as white swans or beautiful and humanlike, with large eyes and white skin scented like lilies. Only dangerous when threatened, they are graceful and enchantingly beautiful faeries known for their powerful magick and helpful ways. As you are drifting off to sleep, imagine your arms becoming wings. Moving them up and down, you begin to fly up in the air. You find yourself in a flock of Swan Maidens, who take you to an enchanted place where golden chains hold up palaces hanging from a giant tree. Below is a pool of water that contains all knowledge and wisdom. You fly down next to the pool of water and look up at the towering tree that houses all realms of being. You think about something you want to know and reach down to scoop up a handful of the water. As you drink, the knowledge rushes into every part of your being. Give yourself the suggestion that you will remember what you want to know when you wake up in the morning. When you awaken, make a note of all you recall from your dreams in your journal. 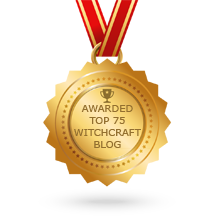 Posted on January 15, 2014 by ladyoftheabyssPosted in Articles, Daily Posts, MeditationTagged Marriage, Milky Way, Moon, Norn, Psychology, Shopping, Social Sciences, Swan maiden, Swan Maiden Meditation, Swan Maidens. pure potentiality, the first physical manifestation had existence. themselves, while others expanded mightily. The first Form came to be. and organizing themselves. The Element Water was born. the new star, which would one day be called Sol, or simply, the Sun. early ocean became richer and richer in dissolved minerals and gases. two, then four. Life was born. of green appeared, drawing energy from the Sun, and exuding oxygen. other. After they had been talking for a while, they started thinking. come to be – and why. Posted on January 14, 2014 by ladyoftheabyssPosted in Book of SpellsTagged Galaxias, Milky Way, Moon, NASA, Spiral galaxy, Spitzer Space Telescope, Star, Sun. This is the time of year when many interesting things happen. As we approach the Winter Solstice on December 21, the days are shorter, and the nights are longer and colder. The frosty nights make for some very interesting sky activity. More UFOs are reported at this time of year than at any other time. The magnetic pole activity is increased around the Solstice, and there are some wonderful displays in the most northern regions. Sometimes these magnetic lights, known as the Aurora Borealis, are seen as they streak from pole to pole by those living further south. There is a fascinating event that sometimes happens on the shortest day of the year if the moon is right! A year from now, on December 21, 1995, the moon will be new and it will be a very dark night. On December 22, 1995, the Winter Solstice, there will be the beginning of a thin waxing crescent moon which will not be seen at night. Either on the eve of or the day of the Solstice, go out at night between midnight and 2 a.m. to witness the sun bleeding over the North pole from the completely opposite side of this planet! The northern sky will appear rosy-red above the northern horizon. I believe we’ll see this next year. I experienced this phenomenon on Winter Solstice, 1993, last year, and it was an awesome sight. I didn’t telephone anyone in the middle of the night to tell them about it, and I’m sure I have friends who were disappointed I didn’t wake them up from their warm beds to share the sight. This year on the Winter Solstice, which is on December 21, the moon sets at 9:13 a.m. E.S.T. and rises at 8:03 p.m. E.S.T. This means the night will probably be too bright to see the bleed-over of the sun because the waning moon will be just six days past the full moon. Keep an eye on the Big Dipper this year. Those in the north can see it fairly well. In the south it dropped below the northern horizon and is now rising back up, dipper first and handle last. If you can locate the Big Dipper (see previous issue, #11), you can locate the North Star, Polaris, and a star constellation known as Cassiopeia’s Chair (see diagram, this page). This time of year it changes from an ‘M’ in the fall, to an upside-down ‘B’ or Greek-looking ‘E’ in the winter, to a ‘W’ in the spring, and then a ‘B’ in the summer. Even in the most southern areas of the United States, Cassiopeia can be seen clearly throughout the entire year. In the fall, this queen sits high on her throne, only to get dumped off of it during the winter months. She certainly deserves it for what she did to her beautiful daughter, Andromeda! Cassiopeia is well-known for having chained her daughter to the rocks as a sacrifice to the ugly sea monster Cetus, which was actually a sea whale. Persus asks Andromeda to marry her and she will consent if he saves her from Cetus. Pegasus, Persus’s flying horse, saves Andromeda and she keeps her promise to Persus by marrying him. Enjoy star-gazing this time of year. Watch for falling stars, and if you see a real UFO, keep your camera or camcorder handy! Krupp, E.C., Ph.D. Beyond the Blue Horizon, Myths and Legends of the Sun, Moon, Stars, and Planets. 1991. Harper Collins Publishers, New York, NY. Pearce, Q. L. Stargazer’s Guide to the Galaxy. 1991. Tom Doherty Assoc., Inc., New York, NY. Pennick, Nigel. 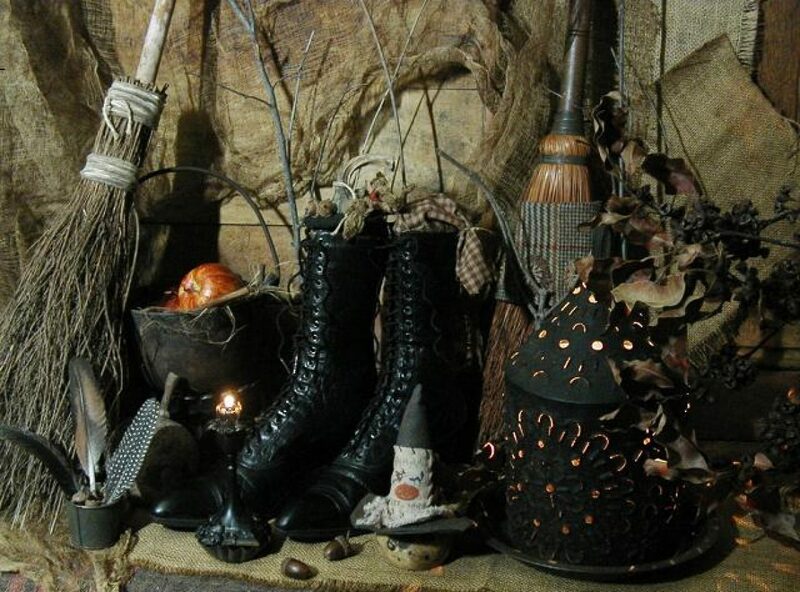 Practical Magic in the Northern Tradition. 1989. The Aquarian Press, Hammersmith, London, England. Raymo, Chet. 365 Starry Nights. 1982. Simon and Schuster, New York, NY. Posted on December 9, 2013 by ladyoftheabyssPosted in Articles, Daily Posts, The SabbatsTagged Aurora Borealis, December 21, Hammersmith, Milky Way, Moon, North Star, northern horizon, Solstice, Sun, the Milky Way, United States, Winter solstice, Yule. The Astrology of 2012: The End of Days? Are you scared? Don’t be! As we approach the infamous date of the end of the Mayan calendar on December 21, 2012, fear continues to mount that it really is the end of days. But fortunately we’re here to set the record straight about that. The good news is that the world will not really end in 2012, although you don’t need to be an astrologer to see how quickly things are changing. You can get key dates and prediction for the year ahead with a Big Picture Yearly Astrology Forecast, but whatever big changes are coming, you can trust we will still be here. Civilization as we know it seems to be in a precarious situation, with growing political unrest and financial stresses warning us that we are repeating epic mistakes from our own cultural history. For example, we have just witnessed the sharpest economic downturn since the Great Depression. Differences in political ideologies and spiritual beliefs continue to fuel increasingly destructive wars and unrest across the Middle East. Environmental threats make our water and food supplies more and more scarce; meanwhile, we are powering our world with a diminishing reserve of oil and others resources. So it’s no surprise that so many people — experts and laymen alike — are predicting that the fabric of our entire society is dangerously at risk. But if you look to the skies, you’ll see there’s nothing to fear on that notorious day in 2012. Astrologers watch the cycles of the Sun, Moon and planets to understand the changing nature of time and to put these shifts into historical perspective. For example, we had a dose of culture-wide panic at the threshold of this century. The start of the year 2000 — or “Y2K” — was as an apocalyptic date; some predicted that it would be the beginning of the “end times.” But astrologers could see then that there were no planetary alignments significant enough to warrant this kind of fear. 2012 is different — there are significant astrological factors that indicate these are truly significant times. But let’s clear one thing up right away: there won’t be a cataclysmic event on December 21, 2012. It’s been claimed that on this first day of winter, the Sun will line up perfectly with the center of the Milky Way Galaxy and that this will confirm the ancient Mayan prophecies. In other words, many claim that the Sun’s change of position will mark the end of time. But there is a scientific problem with this reasoning: The Sun’s alignment to the galactic center on Winter Solstice moves at the rate of one degree every 72 years! Therefore, this cosmic event is so slow-moving that it lasts more than a decade. As astrologers track the cycles of planets, they pay special attention to the lunation cycle, which is the monthly flow of New Moons and Full Moons. This is how they are able predict the impact these movements will have on the personal and emotional cycles of our daily lives. Meanwhile, astrologers also track the activities of the slower-moving outer planets (the ones with the longest orbits), which create their own rhythms and are more closely related to large historical cycles. For example, Uranus symbolizes sudden changes that release explosive energy, which is why astrologers refer to it as “The Great Awakener.” Pluto symbolizes total metamorphosis. The deep transformation that’s associated with mysterious Pluto is dramatic and complete, like a caterpillar evolving into a butterfly, which is why the profound cultural shifts of the 1960s corresponded with a conjunction between surprising Uranus and passionate Pluto in 1965-1966. In the summer of 2012, these two planetary harbingers of change will come into a hard 90-degree alignment — their first since the mid-1960s. This dynamic angle between lightning-like Uranus and intense Pluto recurs seven times from June 24, 2012 through March 16, 2015. This is the period of upheaval we should be looking at, rather than focusing on a single day in 2012. From an astrological perspective, we don’t have to wait until 2012 for the action to begin, because we are already in a time of profound change, not unlike the 1960s. Now, however, we communicate in ways that are far more revolutionary, due to our constant interconnection via cell phone, email, Facebook, MySpace, Twitter and numerous other social networks. There are new political opportunities for disenfranchised people all over the world to connect with one another, which may explain Barack Obama’s meteoric rise to the Whitehouse over the fearful cries of the old-school American political machine. It is this factor — our ability to communicate more quickly and openly — that will prevent the end of the world. Some of us may play larger roles in the current changes by getting involved in community, national or global politics. But each of us adds to the total picture when we live our individual lives responsibly. Astrology reminds us that there is no time to waste — we are each an agent of change and each of us can impact the big picture by replacing doubt with courage, and by conquering fear with love. Posted on December 17, 2012 by ladyoftheabyssPosted in ArticlesTagged Barack Obama, John Cusack, Maya calendar, Milky Way, MySpace, Pluto, Uranus, Winter solstice. Gold is said to purify and energize the physical body, improves circulation, and strengthens the nervous system. It can balance and develop the heart chakra, along with the hemispheres of brain. It can also act as an aid to tissue regeneration, attract positive energy into aura, amplify thought forms, and aids personal illumination. Posted on November 24, 2012 by ladyoftheabyssPosted in Daily PostsTagged Anahata, Ancient Egypt, Ascension of Jesus, Celiac plexus, Evolution, Milky Way, Physical body, Thorax. Color: White to tan with a milky sheen Magical Properties: The energy is balancing, introspective and lunar. It is a stone for hoping and wishing. Alleviates emotional tension and enhances positive attributes of creativity and self expression. Stimulates confidence and composure. Brings calmness and awareness. Eliminates insomnia. Eases PMS and the change-of-life. Helps with dieting. Posted on November 23, 2012 by ladyoftheabyssPosted in ArticlesTagged Astronomy, Conditions and Diseases, Creativity, Energy, Finland, Health, Insomnia, Mars, Milky Way, Moon, Moonstone, Sleep disorder, Uranus. When the door opens you yell, “Trick or…” and you can’t remember the rest. By the end of the night you have a bag full of restraining orders. You have to carefully choose a costume that won’t dislodge your hair piece. Posted on October 28, 2012 by ladyoftheabyssPosted in Daily PostsTagged Candy, Chocolate bar, Halloween, Keith Richards, Milky Way, Power Ranger, Shopping, Snickers.